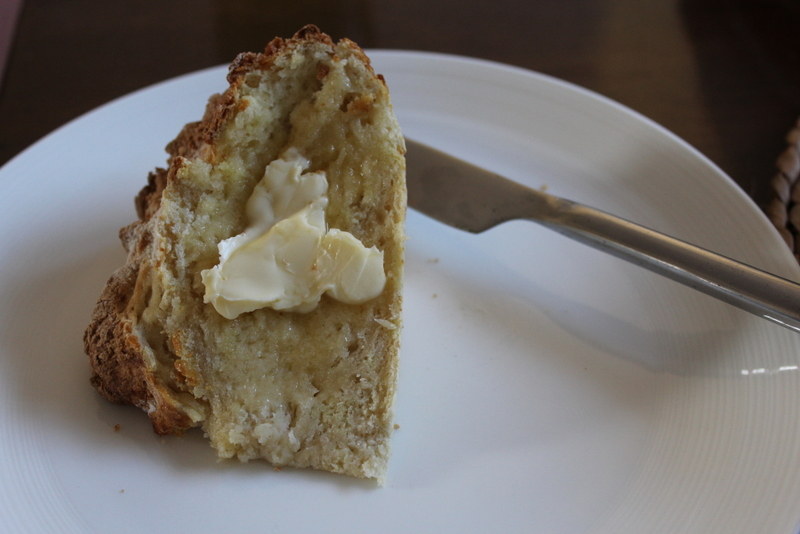 My Mother is from Northern Ireland and whilst my other half is a kiwi, he does have very strong Irish roots, so I feel well-placed to pick something to bake from Ireland. I have really happy memories of visiting family in N.I. as a child and staying with my Grandparents, playing in their fantastic garden, popping round to the neighbours who lived in an old mill which had a glass floor in the kitchen so you could see the mill wheel below. I also remember hearing the bats scrabbling around in the roof above our bedroom (which did used to freak me out). Before knowing there were bats in the roof, I remember having quite vivid dreams about little animals sitting in their armchairs in a wood-panelled sitting room with an open fire and the scrabbling noise was them all getting up and getting ready for bed! It’s amazing what imagination you have as a child. When my uncle showed us the bats leaving the roof at dusk I slept a lot better as I then knew what they were! I also loved our trips to Donegal, staying in a little cottage, with peat fires (I love that smell), brown, peaty bath-water so you never really knew if you were clean or not, walking to incredibly beautiful, rugged beaches without seeing another soul, spending hours collecting shrimps and then being horrified as I watched them turn pink as they were poured into a saucepan of boiling water for supper. Mucky Cow Bay was one of the beaches nearby – so-called because of all the cows that left ‘presents’ on it! I can’t remember if that was the nickname we gave it or if that was its actual name! 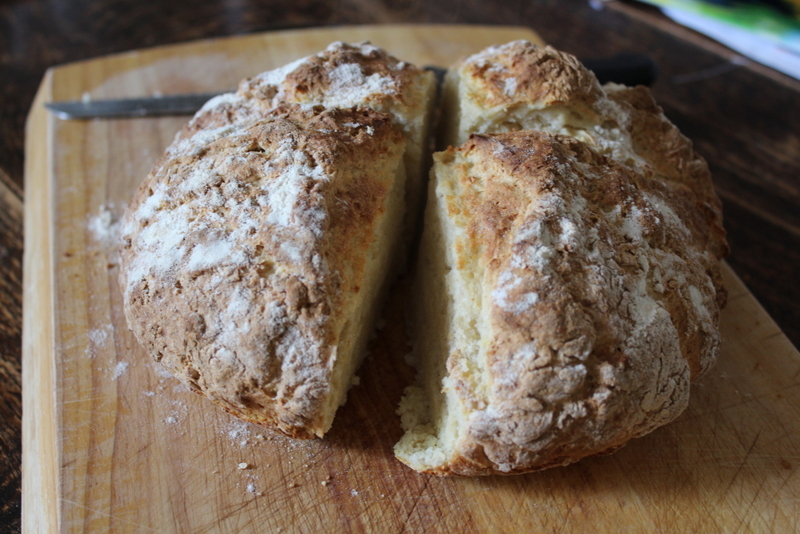 My Step-Grandmother makes the most fantastic soda bread. Particularly good with her home-made raspberry jam (which would be made from the raspberries grown in the garden!). Delicious. I haven’t been to see her for years, which is really bad (note to self – must arrange a trip). I don’t have her recipe, but I’ve tried the Paul Hollywood recipe below a number of times with varying degrees of success. Once I decided to try to make it without buttermilk, using the technique of souring your own milk with lemon juice (add about 250ml milk to 15ml lemon juice, leave for 5 mins). Suffice to say it wasn’t a success and I’m not sure if that was down to the fact that it just didn’t react properly with the bi-carb or if I didn’t get the quantities right. I’d like to try it again just to see if I can get it right, but it’s a lot of flour to waste if it doesn’t work. Think I need to do some more reading up on it. In short, I’d use buttermilk!! There are loads of things I could have picked for Ireland – potato cakes, Irish Stew, chocolate Guinness cake (made it before and it’s delicious, from the Hummingbird Bakery Cake Days recipe book) – and whilst soda bread is not the most imaginative choice for Ireland, I love it, and that’s a good enough reason as any. In a large bowl, mix together the flour, bicarbonate of soda and salt. Add the buttermilk and mix until a sticky dough forms. Lightly flour a work surface and tip the dough onto it. 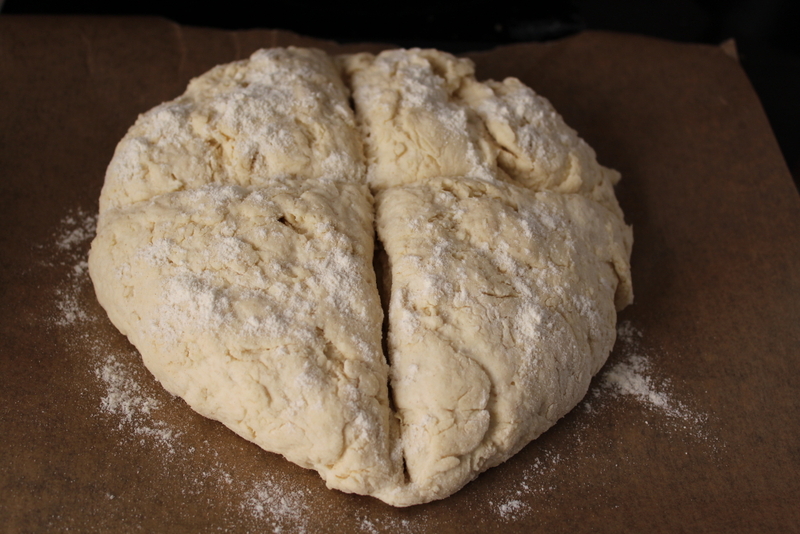 Gently roll and fold the dough a couple of times to bring the mixture together. Do not knead. Shape the dough into a ball. Flatten the ball gently with your hand. Score the dough with a deep cross dividing it into quarters. I read somewhere that cutting almost all the way through helps the bread cook in the middle more quickly. Dust the bread with flour. Place onto a baking tray lined with baking parchment and bake for 30 minutes at 200C/400F/Gas 6. The loaf should be golden-brown. The bottom should sound hollow when tapped. You can use a mix of white and wholemeal flour which is also really nice, but I didn’t have any in the house, so just used white. 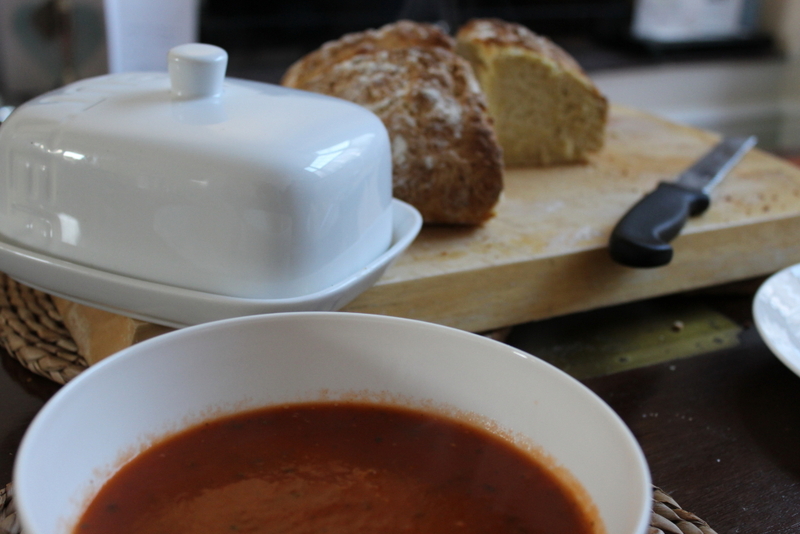 Perfect with a steaming bowl of tomato soup (or with raspberry jam at tea time! ).